This article presents a case report with presumed diagnosis of idiopathic carotidynia (clinical, radiological and laboratory findings). Serial imaging exams (Doppler ultrasonography, MRI and angio-MRI) and laboratory follow-up documented the patient response to corticotherapy and its complete resolution. Within a longstanding discussion in the literature about the definition of carotidynia, our findings corroborate with its existence as a pathological disease. Originally described by Fay in 1927  the term carotidynia is a frequent object of discussion regarding its existence as a pathological entity itself. In its original description it was reported as an atypical neck and face pain with increased sensitivity to pressure on the common carotid artery topography. In 1988, the International Headache Society (IHS) defined the diagnostic criteria for idiopathic carotidynia which were: A. Presence of at least one of the following symptoms overlying the carotid artery (painful with applied pressure, swelling and increased pulsation); B. Structural lesion in the carotid artery ruled out by means of suitable procedures; C. Neuralgia of the neck and head with spontaneous improvement within 14 days; D. Pain on one side of the neck and in the nape, possibly radiating. The term idiopathic carotidynia was removed from the revised classification of the IHS in 2004  based on the assessment by Biousse et al. who defined carotidynia as a unilateral neck pain syndrome, secondary to vascular and nonvascular causes, due to the fact that several cases previously described in the literature as idiopathic carotidynia did not meet the 1988 criteria . There are numerous reports in the literature of a compatible clinical syndrome associated with other pathological conditions such as migraine, vasculitis, arterial thrombosis, infectious and neoplastic processes [4,5]. Certain authors  accepts carotidynia as an idiopathic inflammatory process without defined pathophysiological substrate, leading to a characteristic clinical condition without structural vascular lesion or identifiable underlying cause (diagnosis of exclusion). Although it is a clinical phenomenon that evolves almost invariably with self-limiting symptoms, the use of antiinflammatory drugs is described as preferable treatment, because it shortens the inflammatory process resolution time, with clinical response and relief of the symptoms . The resolution of the imaging findings seems to follow the clinical response to the implemented therapy as described in the available methods above. We present a case report following others that add significant arguments in the analysis of this controversy by using imaging methods associated with laboratory and clinical data. We report the case of a 32-year-old male patient, with oneweek mild cervical pain irradiated to the upper cervical region and external auditory canal, with no history of trauma, and worsened by local palpation. The patient had no comorbidities and was not under any medication. On physical examination, there was no evident neurological deficit or cervical lymphadenopathy. 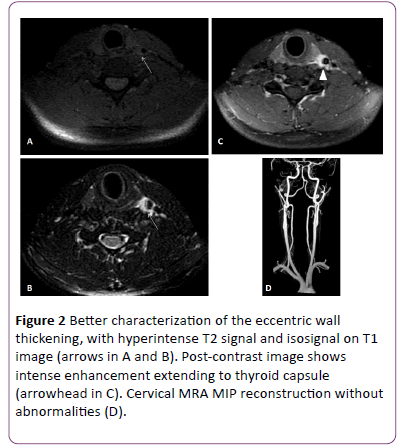 A cervical ultrasonography was performed, which showed the presence of eccentric hypoechoic posterior wall thickening on the left common carotid artery (LCCA), maintaining its usual caliber and flow, with no evidence of intimal lesion (Figure 1). The patient was then referred to cervical magnetic resonance, including magnetic resonance angiography, which better characterized the eccentric thickening of the distal segment of the left common carotid artery without luminal obstruction (Figure 2). The resonance study also showed no changes in caliber and signal flow of the vessel, excluding the diagnosis of arterial dissection (Figure 2). 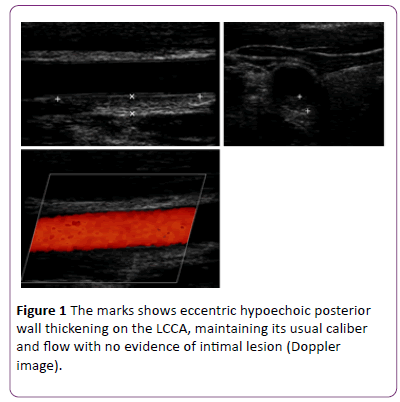 Figure 1: The marks shows eccentric hypoechoic posterior wall thickening on the LCCA, maintaining its usual caliber and flow with no evidence of intimal lesion (Doppler image). Figure 2: Better characterization of the eccentric wall thickening, with hyperintense T2 signal and isosignal on T1 image (arrows in A and B). Post-contrast image shows intense enhancement extending to thyroid capsule (arrowhead in C). Cervical MRA MIP reconstruction without abnormalities (D). The exclusion of other structural alterations of the vessel associated with clinical, laboratory and imaging findings of this case are similar to those previously described in the literature, and they meet the old criteria of idiopathic carotidynia described in the first IHS classification in 1988. Treatment was performed with prednisone 40 mg/day for two weeks, followed by progressive decreasing doses. The patient showed improvement in symptoms and progressive reduction of the wall thickness on serial ultrasound examinations characterized since the early days after the beginning of the treatment, with resolution of the inflammatory process on the control MRI (two weeks after the first study), which showed only a slight residual thickening (Figure 3) that persisted in the ultrasonography performed three years later. Figure 3: A and B shows post-contrast T1 weighted MR images comparing the the first exame (A) and the control 15 days after the clinical onset (B). 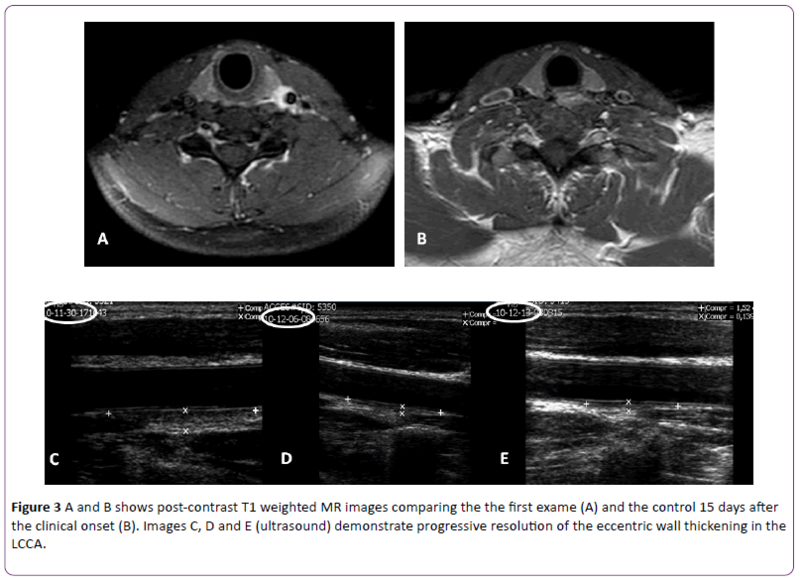 Images C, D and E (ultrasound) demonstrate progressive resolution of the eccentric wall thickening in the LCCA. The controversy over the real definition for the term carotidynia has been the subject of several publications. Numerous case reports in the literature show the same set of signs, symptoms and imaging findings, despite the removal of this entity from the second IHS classification. The imaging characteristics repeatedly described have been gaining importance. An ultrasound study observed eccentric wall thickening of CCA, characterized by hypoechoic tissue beds on the vessel wall with a predominance of inflammatory cells [8,9], without promoting reduction of the vessel caliber or any change in the flow velocity on Doppler ultrasound. MRI still shows the most characteristic findings, with a better characterization of the eccentric wall thickening of CCA, with hypointense signal on T1 and hyperintense signal on T2, associated with regional contrast enhancement, denoting inflammation, including of adjacent structures . The imaging findings (overlapping those described in the literature) along with the results of laboratory tests, and patient’s clinical and radiological follow-up (which excluded the possibility of other etiological entities to justify the condition) favored the presumed diagnosis of idiopathic carotidynia, and proved therapeutic efficacy, shortening the clinical course of the diseasetable. Although there are not enough published data to prove the actual existence of carotidynia, we believe that case reports recently described – even if they eventually do not meet the old IHS diagnostic criteria-are sufficiently well documented, especially from the radiological perspective, to promote interest in studies with a larger number of patients, despite the rarity of this clinical entity. Fay T (1927) Atypical neuralgia. Arch Neurol and Psych18: 309-315. Second Headache Classification Subcommittee of the International Headache Society (2004) Classification and diagnosis criteria for headache disorders, cranial neuralgias and facial pain. Cephalalgia24: 70-71. Biousse V, Bousser MG (1994) The myth of Carotidynia. Neurology 44: 993-995. Azar L, Fischer HD (2012) Carotid perivascular inflammation: an unusual case of carotidynia. RheumatolInt 32:457-459. White JR, Bell WL (2003) Dysphonia associated with migraine carotidynia and responding to dihydroergotamine. Headache 43:69-71. Van der Bogt KEA, Palm WM, Hamming JF (2012)Carotidynia: A rare diagnosis in vascular surgery practice. EJVES Extra 23: e18-e19. Rocha AJ, Tokura EH, Romualdo AP, Fatio M, Pinto Gama HP (2009) Contribution imaging for the diagnosis of carotidynia. J Pain Headache 10:125-127. 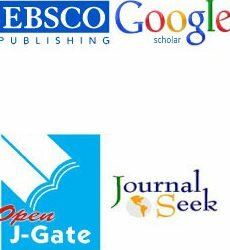 Tardy J, Pariente J, Nasr N, Peiffer S, Dumas H, et al. (2007) Carotidynia: a new case for an old controversy. 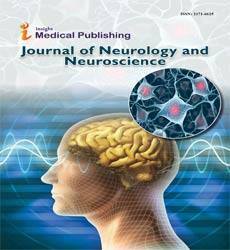 Eur J of Neurology 14: 704-705. Schaumberg J, Eckert B, Michels P (2011) Ultrasonographicimaging and magnetic resonance imaging of the self-limiting disease. ClinNeuroradiol 21:91-94.